We sat on a couch in her living room the night before we left for Texas and discussed how adoption could work. The baby she was carrying was due about the same time her son turned 1. She believed adoption was the best plan – both for the son she was raising and the one growing inside her. We left her house believing she was committed to her decision, but we hadn’t talked with the birth father yet and had one hesitation: We live in a typical small town, where people know each other’s business. We love our adoption stories – and we love telling our adoption stories. But some details of adoption don’t need to be tossed around small-town gossip circles – or even among my husband’s large extended family that has lived here for generations. The birth mom was on the same page, uninterested in small-town drama. We met with the agency anyway, but the more we talked about it the more clear our decision seemed to be. Conversations and prayers led to peace, erasing our hesitation. When we returned from Texas, we proceeded with this second independent, private adoption we weren’t expecting but were thrilled to embrace. We meet the birth mom at her next appointment and saw our son via ultrasound. He was 25 weeks in his birth mother’s womb and weighed 1 pound 7 ounces – so much like his big sister’s storyline. The second independent adoption process we had dreamed of unfolded in ways better than we imagined. Adoption had blessed our family once and God was doing it again, in some of the same ways and in plenty of different ways. In the end, God’s faithfulness remained and he continued to hear the desires of our hearts. It’s a good reminder for me too. 🙂 That’s one thing I talked about on the radio this morning – writing my story was so therapeutic because God used the process to remind me of what he has done and will do. Love you, Beth! 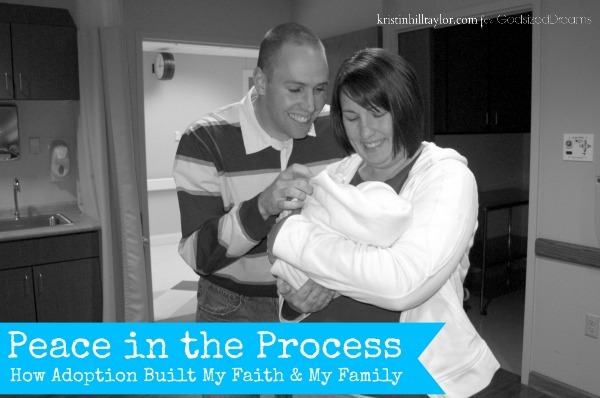 I love your God-sized dream for your family and seeing how it unfolded through your story. ” Conversations and prayers led to peace, erasing our hesitation.”…..I love how prayer and God erases all of our hesitation in following God into His will for our lives. Beautiful story!!!! Thanks, Lori! It’s truly the peace that passes all understanding that God can give us.